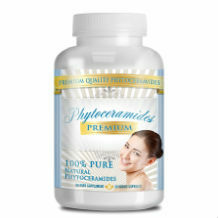 InstaNatural Phytoceramides is an anti aging product that is reputed to combat the common signs of aging like fine lines and wrinkles. It is gluten free and it is said to be far much better than many three hundred and fifty milligrams of Phytoceramides out there. This claim is made by the manufacturers themselves who have not made a point to validate and provide proof for that theory. I believe that if you are going to crown your product as the best, you should always back up your claim. InstaNatural is also said to contain all natural ingredients that are beneficial to skin health. This is particularly credited to the Ceramide-PCD ingredient as it is known to be powerful in fighting aging. Recommended dosage for this product is taking one pill a day while having a meal. There are no side effects stipulated by the manufacturer for this product. However, there is a warning for all women that are nursing or pregnant. They are advised to see their physician before taking the pills. This warning also applies to people who are under 18 years of age. There is also a warning statement about allergies on the bottle of the product. A bottle for InstaNatural Phytoceramides goes for fifteen dollars and ninety seven cents. Considering its reputed potency in its ingredients, that is quite inexpensive for a thirty day supply. Wonderfully enough, the manufacturer offers an amazing guarantee that is for life! Yes, if you ever feel the need to return the product opened or unopened, you can do so and get your full refund back. This means that the makers of this product are very confident about their product. Obviously, this is quite the product. With its life long guarantee, you cannot go wrong with that, although the claim that InstaNatural is better than all phytoceramides out there is questionable. The fact that it is so cheap is questionable as well. With the allergy warning on the label, one can wonder whether it is safe to take because there are really no specifications about the allergies. The lack of clear instructions for the supposed allergies is not so assuring. InstaNatural has been labelled as one of the best out there. if you are going to make such a bold statement, then you should be able to back up your claim. When you talk the talk, you have to be able to walk the walk. There is no FDA approval for this product, nor is there any validation to these statements. On the vast market of Phytoceramides Supplements, there are always those companies that offer better, effective, quality assured products. You just have to do extensive research in order to find them.